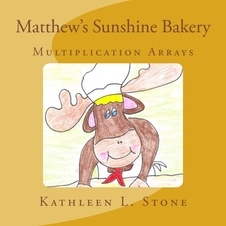 After reading Matthew's Sunshine Bakery,​ children can practice making their own arrays using Matthew's Bakery Trays (found under Resources). Each child gets a different "cupcake" array to color and label. Once completed, they fold their answers to the back so others cannot see the answers. Using the Kagan structure of "stand up, hand up, pair up," they find partners to practice identifying different arrays. Once partners have identified the arrays, they are able to self-check their answers by unfolding the paper. After thanking their partner, they find a new partner and repeat the process. Anytime I can get my students up and moving, it's a good thing! They have so much fun looking at each other's arrays ... much more fun than they would have with a "traditional" paper/pencil activity!